The snow is only fluttering now. It is large as goose down and I can follow a single flake from its appearance outside my attic window as it tumbles down to the slushy street. Cat asleep on daybed. Knitting project put aside momentarily. Within this small room, my study, a picture of contentment. For this moment I take refuge in the appearance of life. Trying to believe that I, the inhabitant of this picture, am really here, am really a human being on earth. Because my soul knows better–it understands that I am a ghost. As is my son Sean in his far-off psych hospital bed who is still puzzling over the wrinkled reality that shot him to another planet. My life tore on the day that my son in his paranoid delusion denied me as his mother, but it didn’t disappear. I had Sean to fight for and I did so ferociously. But time is time, and when wrestling with mental illness time slows down. My fight has slowed, my hope subdued. Each milestone I yearn toward opens up new pain. A year ago, I fought to get Sean into a shelter only to have him refuse treatment and end up on the streets worse than before. I sent his father to find him and what he discovered was so wretched it nearly cost my son’s life. The LPS state conservatorship that we won was miraculous, and yet, the ensuing months of locked care have yielded few results. Sean lives a drugged, lonely life in a suspended state of what I can only imagine is merely adequate psychiatric warehousing. While it is so, and while he refuses all contact with me, I can never come home to myself. Part of me will always be whisped around him, embodying his disjointed sense of self with my own. It’s exhausting. In two weeks I am planning to fly out to visit his treatment team and to try to make contact with Sean. My first time in California since my intervention two and half years ago. I fear for myself, what it will do to me to come face-to-face with his shabby surroundings and the inadequacies of this care. I remind myself there are good people there: His conservator is a beautifully attuned woman with a solid spiritual wellspring; his program manager downloads music for him and talks art and books. A man from FERC, an incredible Bay-area resource for families dealing with a loved one with mental illness, will meet me for support. And Sean has lucky invisibles: The person who helps him wash. And brings him pills. And tries to lure him to attend groups. And serves him meals. And delivers the books I send under the guise of “county donations.” I pray they are kind to him. I pray I will find kindness too. This entry was posted in mental health conservatorship, mental illness, mothering, parents of adult mentally ill children, prayer and tagged homeless, institutionalization, mothering, psychiatric hospital, schizophrenia by esseffone. Bookmark the permalink. 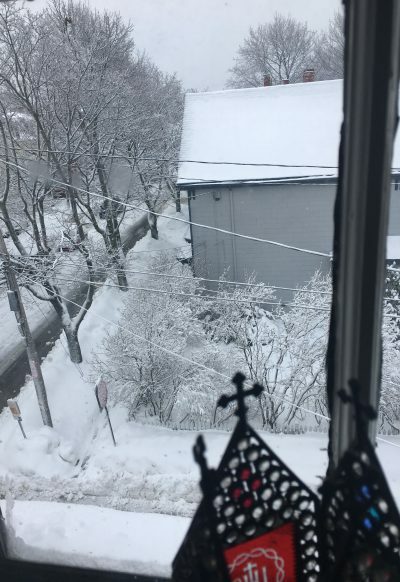 Oh, thank you for sharing your snowy garret view with us, and the reminder of what strength it takes to choose to keep living with “subdued hope.” It helps to shore up my broken heart too. And thus my prayer for kindness is answered. So soon! So beautifully! Sorry you are going through this. My son will be 22 next week. Diagnoses schizophrenia almost 2 years ago. He is barely stable on his meds but at least he is home with me. I am beginning to feel like a human person again slowly. It has been awful. I was lucky o caught the illness early and my son is compliant with treatment and meds. I can’t imagine what it must be for you to deal with what you are dealing with. Life brings so much pain. And the rest don’t the world doesn’t really get it. My prayers for you and your child. Don’t give in to dispair. There is always hope. Always hope.